Looking for a fun challenge? Grab your ISC stamps, and some boxes and play along in this month's challenge and you could win 1 FREE ISC stamp sheet of your choice! So, what's the challenge? Simply create a box using ISC Stamps then leave a link on the ISC Blog Challenge Post with a link to your project by April 5, 2009, for your chance to win. 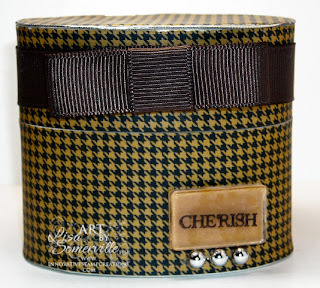 I covered a paper mache box with Teresa Collins paper, tied on my Chocolate Grosgrain. My image is stamped on a fragment, then adhered to a piece of mustard card stock then to my box. Just LOVE this type of project, Lisa...so nice and love your paper!